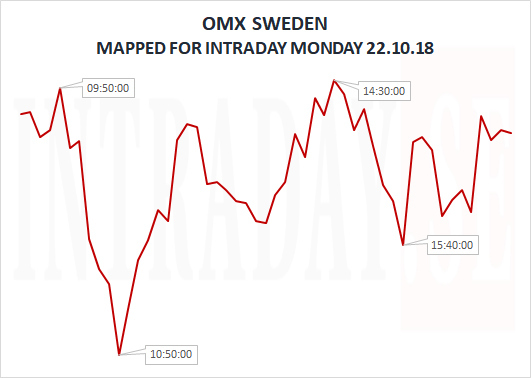 Based on researched data of the Swedish OMX30 index for Monday 05. November, this is what an intraday map could look like. The last couple of months favours the short side for Mondays. If this trend is to continue, looking at the graph above, the high of the day could turn out to occur from at least just after lunch to run into the close. Remember to always keep a preferred stop loss in place. Markets tops as of Tuesday 30th Oct.
Nasdaq100 continues its weakness from Oct 1st, and is now down 11.2% since the recent peak. The table below shows how the present trading-level unfolds compared to the 2007 and 2000 peaks. Markets are now 21 intradays post its very Nasdaq100 top. This table outlines performance through next Friday (29 tradingdays post its respective daily peaks). The table overview could now paint a consolidation fase over the coming 9 intradays for the index, and somewhat stronger Silver prices going into next Friday. 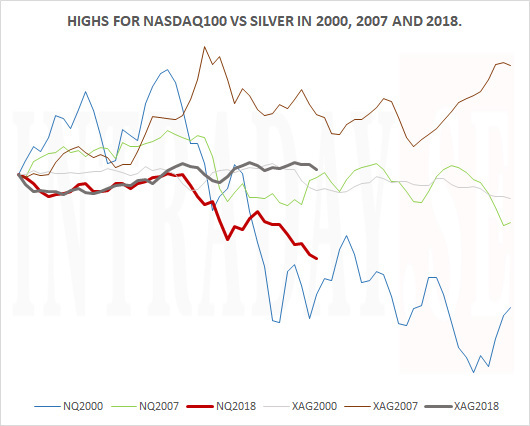 This next chart shows the development for both Nasdaq100 index and price of Silver for 46 intradays post the 2000, 2007 and 2018 peaks. 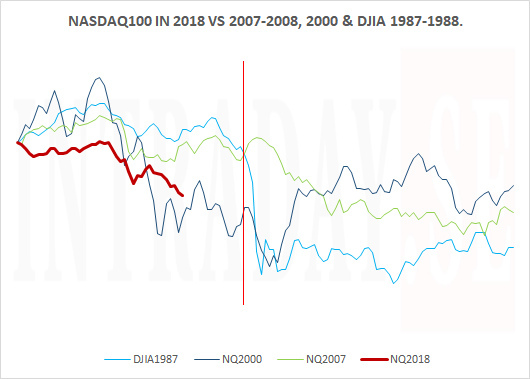 This last chart compares 1987 for DJIA vs Nasdaq100 in 2000, 2007 and 2018. The red vertical line is placed at November 14th 2018, and the chart displays 100 tradingdays post respective peaks. Only time will show if history is a trading map. Sweden OMX index for Tuesday 30th. 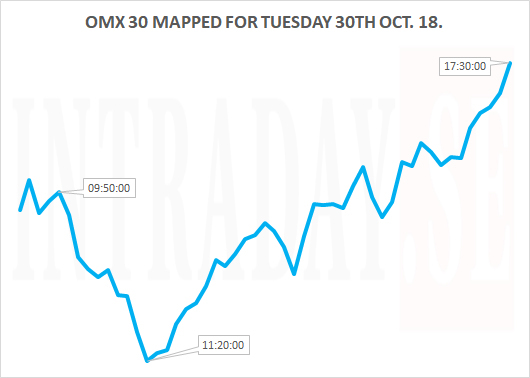 An intraday chart for tomorrow Tuesday of the Swedish OMX 30 index is mapped out below. This chart is created from analysed intraday data spesified for the upcoming day. A turnaround during lunch hours (CET) could be in the terrain, but be aware that a timewindow could pause an already existing trend and even make it accelerate. A preferred stop loss needs to be in place at all times. 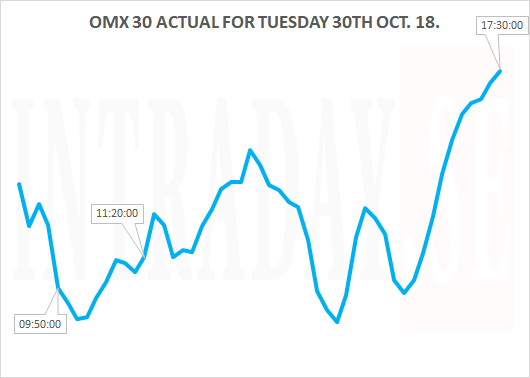 ...and below is the actual intraday Tuesday 30th. The two main turningopint could turn out to be 10:50 CEST and 14:30 CEST. Based on last weeks data the index may move until 30 points intraday (low to high or high to low). Remember that a turningpoint can act as pause to an already ongoing trend, and may act inverse to what you already see. Nasdaq100 Future index shows a clear pattern to the downside on Wednesdays the last weeks. This is 10 minute bar chart shows the trend. Research shows that Wednesdays (by far) shows the weakest intraday trend for the day of the week lately. According to the chart, it is worthwhile to be aware of the potentially strong intraday trend from 08:30 AM CEST into about 17:10. These are the timewindows to look for highs and lows. From about 20:20 into the late night there has been strong selloffs. Always remember that moves may set up to be inverse to what you see, and that timewindows could be important for the very next move. 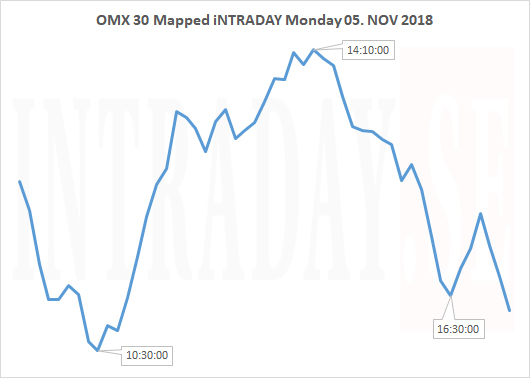 .....And below is the actual Wednesday 17.10.2018 vs the Wednesday intraday map shown Tuesday. By following todays map, a stop loss of 20 points would have been ok, and the reward from a shortposition at 08:40 CEST to 17:10 resulted in a + 100 points trade. 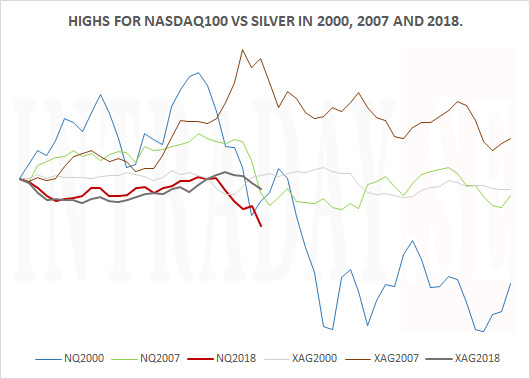 Silver vs Nasdaq100 below. Continued from yesterday - see yesterday for table explained. Today is intraday number 8 from present Nasdaq100 top. Yesterday saw a major fall for the Nasdaq100 index relative to the 2007 topping formation. If 2007 is a route, the index may fall another 2% today, only to recover somewhat tomorrow to go sideways next week. The year 2000 route shows stength today and tomorrow, and then trending down significantly next week. The table shows Silver to outperform this next period. The chart below gives you present state. 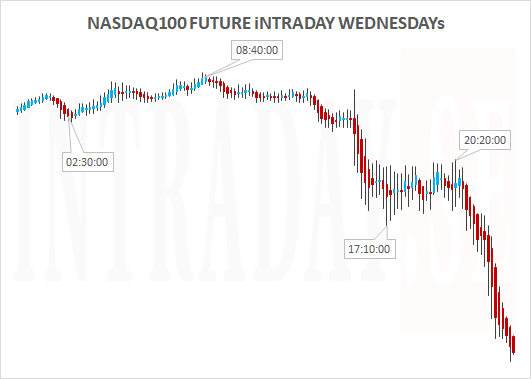 Today Wednesday is the 8th intraday since the Nasdaq100 (temp.) top. 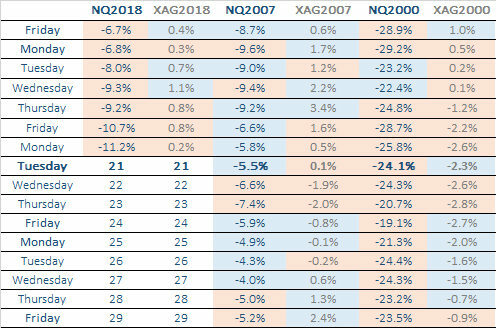 Below is a table showing how the present terrain for the Nasdaq100 index now evolves compared to the 2000 and 2007 tops. If the number is BLUE, it marks stronger trading than the day before. 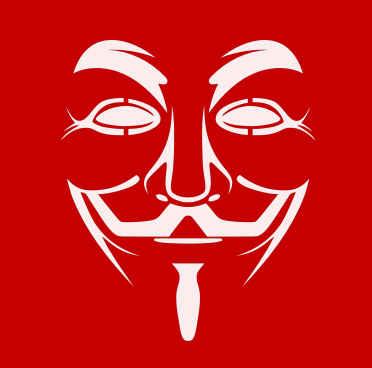 If the number is RED, it marks weaker trading than the day before. The 2000 market top shows strong trading today, tomorrow and this Friday. The 2007 market top shows weak trading today and tomorrow, and somewhat stronger this coming Friday. 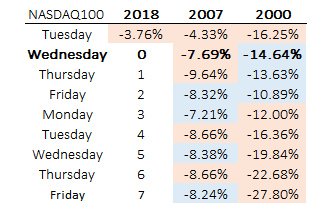 Next trading week is weak for 2007 and extremely weak for 2000. Only time will show if any of these years are maps for our present trading. Nasdaq100 index now compared to its topping development in 2000 and 2007. Regardsless of how you look at it - this should be an interresting chart if you are into the markets in any way. 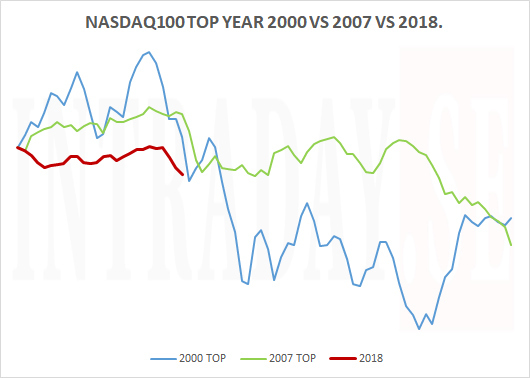 The RED line shows where the Nasdaq100 index is trading right now indexed to the year 2000 top and the 2007 top. The chart shows you the index performance 20 tradingdays pre the daily topaction, and 55 days post the daily top action. Looking at the 2007 top, the index trades sideways from todays levels for about 35 more tradingdays and then head further south. The 2000 development shows us a steep decline within the next few trading sessions, and thereby see more choppy to downtrending intradays. 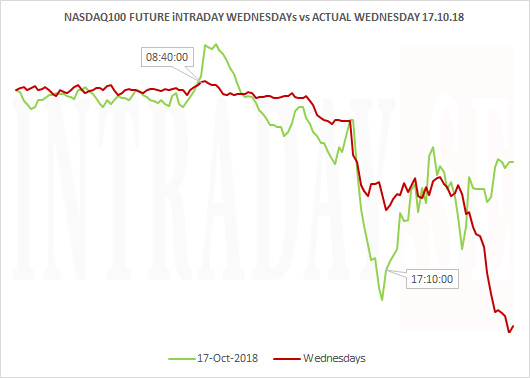 Looking at the Nasdaq100 Future index intraday for the entire week the last weeks, you now see that Thursday is the strongest and the best intraday for Longs, and Friday is the weakest day and best intraday for Shorts. Analysis consists of intraday data from daily Opens through its Closees. The intraday Thursday long positions should be exited just after the US Open at about 15:40, and the Fridays shorts should be held until session close. Wednesdays seems to be a steady down day, and positions may well be kept from the Open to its close. 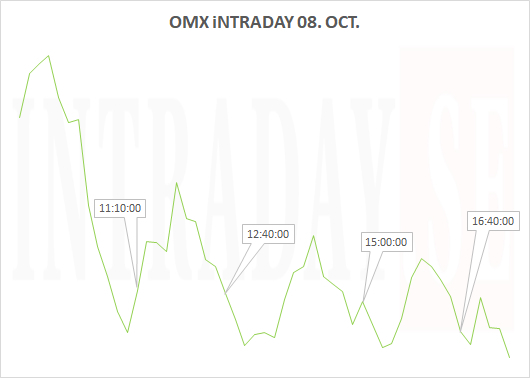 OMX Sweden 30 index intraday Mondays displayed. Looking at the last Mondays, this is how the priceaction for this Monday may evelove. Buying pressure from the open until about 11:10 thereby a low around 12:40. A top at 15:00 followed by a low around 16:40. Only time will show if this is a type of map for tomorrows intraday action. ...Looking back at this Monday the 8th, here is the result: Trading +1 point +- zero because of spread. 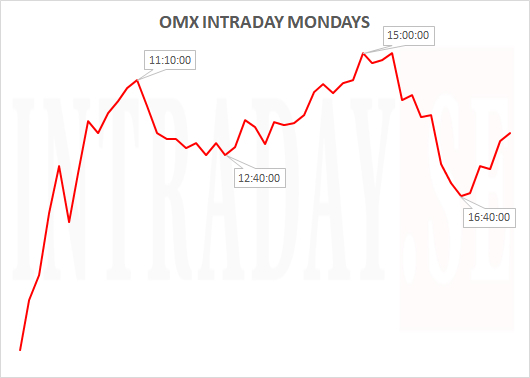 Timewindows from passed Mondays are placed into Monday the 08th intraday chart to show the test of the day. 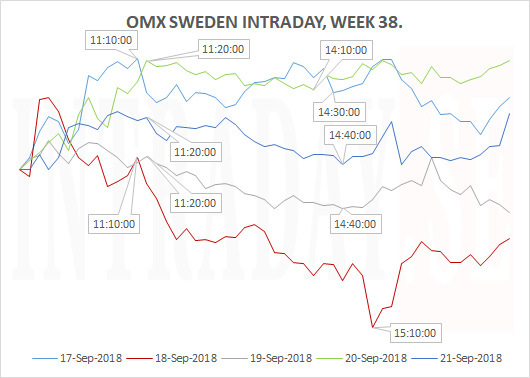 OMX Sweden intraday week 39, 24. - 28. September. The two timewindows worth notising are 12:40 - 12:50 and around 14:20 (GMT + 1HR). Any strenght or weakness above or below their high or lowpoints could trigger its continued direction. Only time will show if these timewindows continues to be significant going forward. Looking at this passed Thursday and Friday, both days shows significant strenght after 14:20 o'clock. 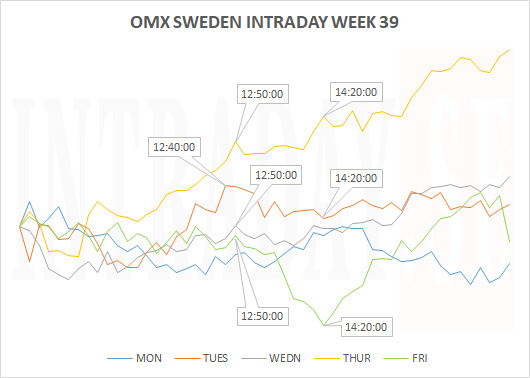 OMX SWEDEN intraday each day for last week 38, 17. - 21. Sept.
- High of the day proved just after 11 o'clock and sliding for 3 hours pluss to make intraday low. By the way, the index shows strenght the last 30 minutes of the day. Maybe the chart gives you clues for this upcoming week? Only time will show. Timewindow displayed are GMT + 1 HR.